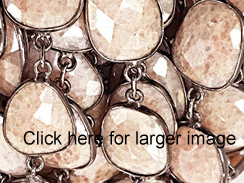 Faceted Mystic Pink Quartz RoseCut chain bezel-led in oxidized Sterling Silver. The stone is approximate 16mm. New item from Jaipur for the most selective designer. Superb quality. Limited supply. Blush connector chain will work with all the neutrals.